For years, some Android manufacturers have been replacing the default emojis with their own set, usually to differentiate their devices. Samsung's set has always been bad, with several emojis showing completely different emotions than what is intended. The company has started rolling out Android 8.0 Oreo to its phones, and the included emojis are a much-needed improvement. Samsung Experience 9.0, the company's modified version of Android 8.0, includes a few changes that brings its emojis more in line with other sets. One major improvement is the 'rolling eyes' emoji, which now actually looks like someone is rolling their eyes. I have no idea what the designer was thinking with the old version. Some of the other changed facial expressions include Grimacing Face (), Tired Face (), Face Savoring Food (), Smirking Face (), and Drooling Face (襤). People have been making fun of Samsung's Grimacing Face emoji for years - at this point, I didn't think it would ever change. In general, facial expressions in the new set are on-center, without any tilt or angle shift. In addition, all facial expression and body part emojis now default to the Simpsons-like yellow color. 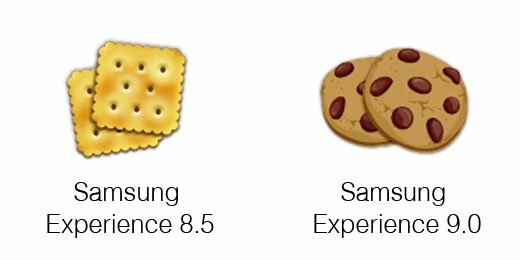 Remember how Samsung used a cracker for the cookie emoji? That has finally been replaced with actual cookies. In addition to all the changes, there are 329 brand new emojis (including skin/gender variants), bringing Samsung's set up to the Emoji 5.0 standard. Some of the new ones include Star Struck (朗), Exploding Head (勞), and Face With Symbols on Mouth (郎). There are plenty of other changes that Emojipedia found in the new set, so be sure to check out the source link below if you want all the details. I'm just glad Samsung's emojis aren't  any more.